Ant-butter, cricket dukkha and roasted mealworms - edible bugs are now well and truly part of the culinary dialogue taking over Australia which in recent years, has focused largely on sustainability and the re-introduction of traditional foods. Although it's taken a while, edible bugs are now being embraced by Western cultures thanks to its many benefits advocated by well-known chefs and celebrities. Entomophagy is the human use of insects as food and over the last few years, the stigma in Western cultures has gone from one of disgust to something of intrigue. A common food in over 80% of the world’s nations such as South America, Africa and Asia, insects have been praised for its nutritional value, nutty flavour and most importantly, its potential to help environmental degradation caused by livestock production. Many companies are now trying to introduce insects into Western diets as an alternative to meat proteins including one Australian start up Grubs Up, who produce insects for human food and animal feed. 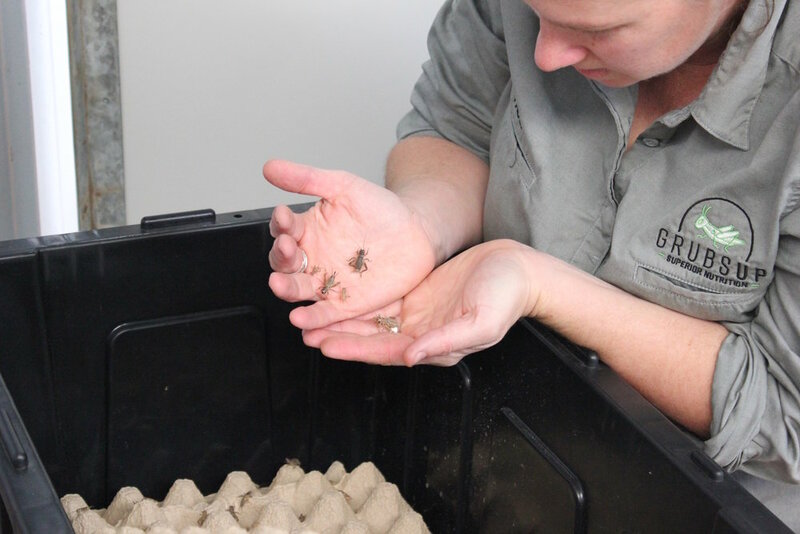 Founder Paula Pownall heads a team who breed insects specifically for human consumption and believes it is one of the answers to a problem we have globally. Their products range from cricket powder to cricket hazelnut dukkha to roast cricket spice. We had a chat to Paula about the growing trend of edible bugs, their many benefits and how we can see more of it on Australian tables. What led you to create Grubs Up? I have a big passion for agriculture and was aware of the many pressures facing the agricultural industry including increases in feed costs. In the past I worked in mosquito management and developed an interest in insects. Once I realised that crickets were over 65% protein, I combined my skill sets, and Grubs Up was born. What are the benefits of eating edible bugs over other proteins? Crickets specifically are a natural product; high in protein, folate, vitamin B12, and have all 9 essential amino acids. They're also very sustainable to produce. When you compare it to other proteins such as chicken, it has more than 3 times the protein. How sustainable is the production of bugs for human consumption? Insects are sustainably produced within a zero waste system. The manure is made into fertiliser and food waste is used to feed the insects. 100% of the cricket is used so it's incredibly sustainable. How are people consuming bugs in their diet? People are eating insects whole roasted and in powder form by adding them to things like smoothies. Insects are a perfect addition to almost any meal. What are the obstacles in the way of people adopting edible bugs in their diet? The fear/ick factor. People don't realise how many health benefits insects have and consider them a third world country food. The price of insect products in western countries is generally very expensive as well. What’s one common misconception with edible bugs? Many people think that bugs taste disgusting, that they're full of disease and unhygienic. They don't realise that insects can be part of a very balanced diet and can be incorporated easily into meals. What do you think it will take to get bugs on more Australian tables? Education on the benefits including the nutritional value. The price point also needs to come down. People need to make consumer choices based on their values, for example sustainability. We also need to see marketing for insects as something more than just a food trend - it needs to stick around. Where do you see the future of food heading in general? I see more clean, whole, non-processed food that can be traced through every part of the system - paddock to plate. I would also like to see a professional association for insect producers and national guidelines introduced from Food Standards Australia. And lastly, what’s your favourite bug to eat and do you have any favourite recipes you’d recommend the edible bug novice? I love whole roasted mealworms added to a tasty nut mix! Our famous Cricket Dukkha is a really tasty addition to any wine and cheese platter, that sure gets everyone talking. Check out the edible bugs Grubs Up has to offer here.